A slew of restaurants will be offering special three-course prix fixe dinners, June 10-19, as part of Dine Downtown San Jose. The prix fixe offerings will be priced from $20 on up. Participating restaurants include Arcadia, Cafe Stritch, The Farmers Union, and Poor House Bistro. For every prix fixe meal sold, Sysco will donate $1 to Martha’s Kitchen, too. The San Jose organization provides meals to those in need. Contest: One lucky Food Gal reader will win a $50 gift certificate to Mezcal Restaurant in downtown San Jose. Use it toward the $30 three-course prix fixe the restaurant is serving up for Dine Downtown San Jose, which includes options such as tortilla soup, grilled steak with chipotle sauce, and warm Oaxacan chocolate cake. Or use it another time. 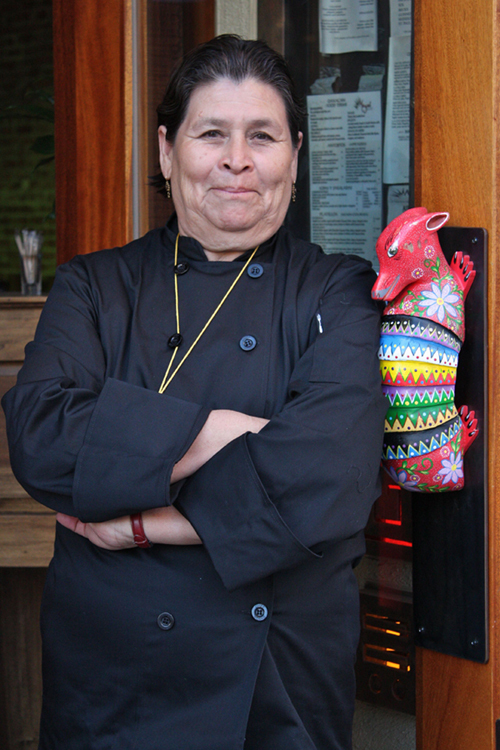 Mezcal specializes in moles, as well as chapulines (fried grasshoppers). If you’ve never experienced the latter, this is the place to try them. Seasoned with garlic, salt and lime, they’re as crisp and addicting as potato chips. So, no need to be squeamish. Contest entries will be accepted through midnight PST June 4. Winner will be announced June 6. Just tell me why you want to win the gift certificate. Best answer wins. I’ve just moved to the area and am in the process of finding good restaurants in the area – this would be a great way to do that 🙂 Thanks for offering this contest! My husband loved Mexican food, especially mole. And i love eating adventurously, having tried fried cricket, scorpion, and bettle in Beijing. I’d love to win the certificate so we can indulge in a last epicurean adventure date-night dinner before our first baby is born! Thanks! I would like to win the $50 gift certificate to Mezcal Restaurant, SJ so I could treat my husband to a nice dinner. He is a great guy, always ready to help me fix things around the house, fill my gas & wash my car when I’m tired, and he always buys me dinner. It would be nice if I did him a favor and bought him a nice dinner. He loves Mexican food! Honestly? It’s for the mezcal. I love tequila and have always loved tequila but as my tastes change, I’ve discovered that i love mezcal just as much (maybe even more)! The smokiness is wonderful and I’ve been veering towards more spicy/savory cocktails over the sugary concoctions of my 20s! To actually go to a restaurant that not only carries mezcal but named after it – squee! Okay, so how much mezcal can a $50 gift certificate buy? I’ll admit that my palette is slowly warming to the taste of mezcal and this gift certificate would go a long way towards fully swaying me towards mezcal. But at the end of the day, in a mezcal vs tequila taste-off, we’re all winners. On a semi-serious note, I’m intrigued at the thought of indulging in some chapulines. I have an adventurous streak in me and though I’ve put many an odd thing in my mouth, suprisingly, grasshoppers have not made it on that list. Here’s my chance to do it for free! What better motivator? It’s been awhile since my boyfriend and I have been able to pause and have 1:1 time together as life happens.. weddings, new jobs,birthdays,etc. Even though I live in San Jose, I have never been to Mezcal. Other than being able to surprise my husband with a free dinner, one of the reasons I would like to win this is to taste their Chile Rellenos and Tamales. These are my absolute favorite Mexican dishes and I am constantly on a quest to find the best ones in the greater San Jose area! You would be surprised at how yucky they are at some places (especially tamales)! My husband teases me that I should try other things — and I do, once I have passed judgement on the Chile Rellenos and Tamales. Also, I have never tried any kind of “Mole” dish and their Tamales de Mole certainly got my attention! I may find myself a new twist on a favorite Mexican dish here! I would love to win this gift certificate to enjoy mole for the first time and celebrate my 16th wedding anniversary with my husband. Being half Chinese Texan (because) of my father, I grew up eating tamales, buñuelos, enchiladas and frijoles…time to enjoy authentic Mexican food at its finest! Hope to hear from you soon. I would give it to my daughter. she just graduated from high school. it would be nice for her to try different things so she can start her foodie journey. I’d love to win so I can treat my parents to a nice dinner!